More than 80 percent of suppliers at last month's Manchester Furniture Show have already rebooked to exhibit at next year's event, organisers have said. Trade association BFM, the British Furniture Manufacturers, has appointed Annie Porter (below) as marketing and administration coordinator, based out of its new Long Eaton HQ. The furniture skills body set up last year to support the industry as the Apprenticeship Levy came into existence is introducing a new initiative to help companies find and manage the next generation of employees. Wakefield supplier W.E. Rawson has been fined £600,000 plus costs following the death of an employee at its premises in 2014. The British Furniture Confederation (BFC), the representative body whose members comprise the sector's leading trade associations, has sent its 2018 Manifesto to key legislators as it looks to highlight the importance of the £17 billion industry to the economy. Retail buyers have signalled their intent ahead of the industry's lead summer trade event with visitors pre-registering for the Manchester Furniture Show up nearly a quarter on last year. Five more companies announced for July 15–17 exhibition in all. Clay pigeon shoot Big Shots, the biggest fundraiser in The Furniture Makers Company calendar, generated £24,000 for the industry charity earlier this month. 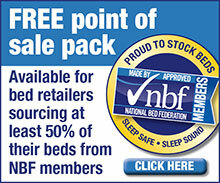 A significant part of Hall 5 at the NEC will be allocated to a new Bed Zone as the next edition of the January Furniture Show hosts its largest concentration of mattress companies since its inception. Bed maker Harrison Spinks and retailer Arighi Bianchi were furniture industry winners at the Family Business of the Year Awards 2018, announced last week. Organisers are calling for entries for this year's Sealy Cup, a five-a-side football tournament that raises cash for industry charity The Furniture Makers' Company. Seven European partners including furniture makers' trade body BFM have combined to develop the content for an International Masters Degree, part of a wider plan to tackle the furniture industry skills shortage. Managers at Leeds beds and components group Harrison Spinks raised £1,400 for industry charity The Furniture Makers' Company after completing a tandem skydive. Space is running out for exhibitors looking to exhibit at international furniture fair IMM Cologne, event organiser Kölnmesse has said. An industry-specific Level 3 Furniture Apprenticeship — backed and funded by BFM and The Furniture Makers' Company — has gained official approval. The owners of the largest furniture, home accents and gift trade fairs in the United States are to merge, creating the world's largest operator of home goods events. Hayden Davies, the former longtime leader of furniture test house FIRA International, has been installed as the Master of The Furniture Makers' Company. Attendance at CIFF Guangzhou — one of the most important trade fairs for the global furniture industry — increased this year, according to data released by show organisers. BFM, the British Furniture Manufacturers association, has supported the launch of an online database that will help companies to employ disabled people. Chelsom is to make its Manchester Furniture Show debut this summer, exhibiting as part of the Midpoint event that co-locates for the first time. Salone del Mobile, the furniture design event widely considered the most important in the world, closed Sunday with attendance up sharply on last year. The specialist furniture logistics company trading as Home & Retail has ceased trading, leaving customers with a longer wait for orders and retailers with a distribution headache. Maggie Throup MP is the new chair of the All-Party Parliamentary Furniture Industry Group, succeeding Stephen McPartland MP, who has stood down after eight years in the role. The Design Guild Mark judging panel (left–right): Peter Thwaites, Fiona Knight, Natasha Marshall, Professor Clare Johnston, Rodney McMahon, Linzi Coppick and Corinne Pringle. Industry charity The Furniture Makers' Company (TFMC) has announced the inaugural holders of the Design Guild Mark's new 2D category. New corporate members for industry charity. Dreams ranked first in The Sunday Times BDO Profit Track 100 league table with four others from the furniture sector also celebrated, including two in the main list and another pair who were named Ones to Watch. Organisers have launched the online registration facility for visitors to attend this summer's Manchester Furniture Show. The two editions of industry fundraiser Big Shots are fast approaching while June will also see the return of the Furniture Industry Sailing Regatta after a ten-year hiatus. January Furniture Show is partnering the Lighting Industry Association to launch LIGHT, a new event aiming to fill a gap in the UK market for decorative lighting. The Furniture Makers' Company yesterday launched a new initiative to support schools that teach design and technology, saying the courses are critical to the industry's future. London Fabric, a key trade show for the sofa manufacturing industry, attracted record visitor numbers to its 2017 edition, organisers say. Trade association British Furniture Manufacturers (BFM) is to host a half-day seminar on the global demand for certified wood products. Visitors numbers at last month's January Furniture Show matched year-earlier attendance as the industry turned out in force for the four-day event. Trade association British Furniture Manufacturers' (BFM) has announced a partnership with Treniq, the online networking platform that puts buyers and sellers in touch with each other across the world. The eleventh Scottish Interiors Showcase launches at a new venue next month with event organisers promising more space, light and easier access for both visitors and exhibitors. A lack of clarity on what the post-Brexit system will look like and the effect of a weak pound are among the chief concerns of the UK furniture industry, the British Furniture Confederation told Parliament last week. Britain's biggest bed maker is supporting vulnerable and marginalised people by donating beds and mattresses to a charitable programme run by local company Recycling Lives. Visitor numbers jumped at an increasingly international IMM Cologne in a sign the global furniture trade is ready to invest in new products. Trade association BFM has introduced a Code of Practice amid renewed vigour for its long-running Great British Furniture campaign, which is being relaunched.